Aomori Osorezan Bitter is a 5% English bitter from Aomori Ji-Beer, based in Aomori, Japan. Like the rest of the range of Osorezan beers from them, Aomori Osorezan Bitter is brewed using locally sourced water from Mt. Osore and was also the first microbrew from a temple in Japan. It undergoes secondary fermentation in the bottle and is deemed a happoshu beer as it is brewed from only 91% malt with the other 9% being from barley according to the Aomori Ji-Beer website. 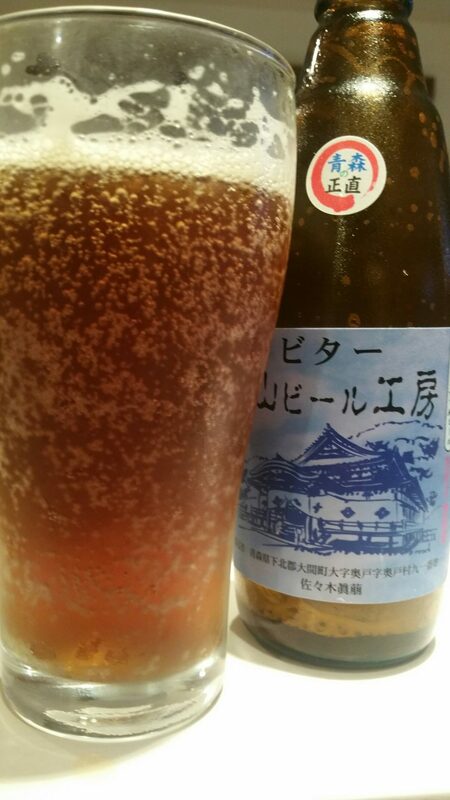 At the time of writing, Aomori Osorezan Bitter can be found in bottles only. Thankfully the last bottle from Aomori Ji-Beer that we have to ever drink. The final final bottle. It’s take me a long 6 months to get through these beers from Aomori Ji-Beer, and for good reason. They’ve all been atrocious so far. So I’ve been saving the “best” for last – or at least I hope I have. Aomori Osorezan Bitter exploded out of the bottle before pouring out a muddy brown colour with lots of visible bubbles. I don’t remember ever having an English bitter this lively before. I know the Osorezan beers undergo secondary fermentation in the bottle but this is kind of ridiculous to see. The aroma was sweet with some hints of sourness going on – perhaps that was the excessive CO2 bubbling away up my nose though. With so much carbonation, Aomori Osorezan Bitter wasn’t the easiest beer to drink. I was hoping for something soft, soothing, thirst-quenching but ended up with something more akin to a soda. There was some hint of caramel among the fizzy bubbling mess, followed by a soft bitter edge, but was it from the beer or from all the dissolved CO2 wanting to get out? Aomori Osorezan Bitter is another strike out for Aomori Ji-Beer. Who’s keeping track of the score?